Do you want to make sure that your house is in the best shape possible? Do you want to make sure that your house smells great? Well, then the best home air freshener is a great step. There are plenty of options available and you can spend any amount of money that you want. Whether you’re looking for something inexpensive that you can spray or plug-in or anything else, you’ll find it in this air freshener buying guide. Scent: What does the freshener actually smell like? With so many different scents you should be able to find something that you really like. Be adventurous and check out a range of different scents that will work for different spaces. Type: Do you want a plug-in or a spray? The type of air freshener that you’re getting is going to be up to you and may depend on the space that you have available. Think about what you like best and how you use it. Natural: Is the product actually natural or is it made with artificial ingredients? This is entirely up to you and it’s going to be personal preference. You get to decide whether it’s important to you to have natural ingredients. Pieces: How many pieces are included in the box that you’re going to get? Are you going to get just one plug or one bottle of spray? Are you going to get multiple bottles or multiple pieces to plug in later or will you be buying more later? Package Size: How many ounces is the package that you get? Knowing the overall size is going to be important because you’ll be able to prepare for what you’ll have and how you’re going to use it as well. Made in USA: Is it made in the USA? Does this matter to you? It’s all about your own personal preference but it’s something that you may be curious about and something you’ll be interested to know at least. With so many different types of air fresheners and so many different scents to choose from as well, you will definitely want to narrow things down. These air freshener reviews will help you do all of that, and more. That way, you’ll be prepared for anything. Just make sure you’re taking a closer look and making your own choice about what works for your home. 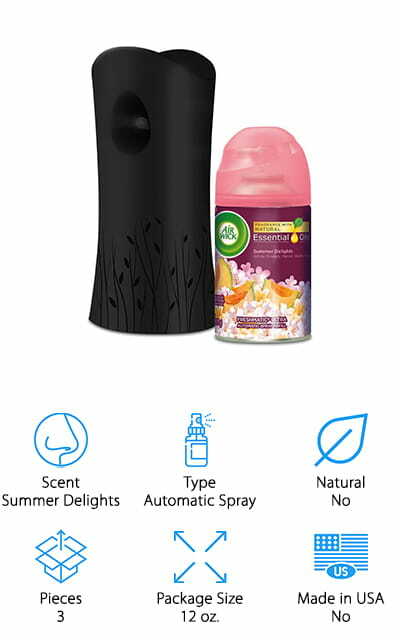 This air freshener spray is our best air freshener for home for several reasons and they start with the price and the scent. You get a fresh orange scent that’s designed to get rid of odor with natural ingredients. In fact, it’s created entirely from pure and natural citrus oils for the active ingredients. 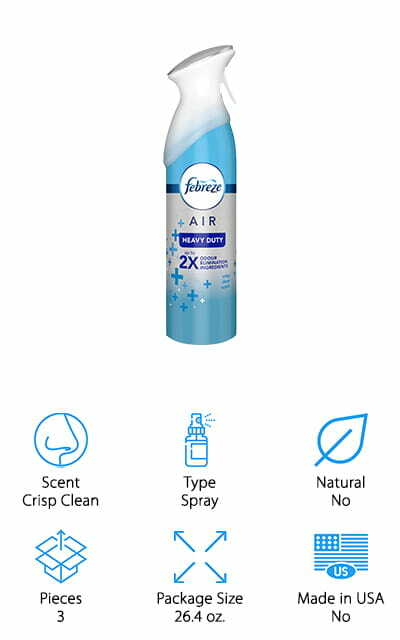 Able to last up to 4x as long as more traditional aerosol sprays, it comes in a 3 pack that means you won’t run out of spray for a very long time. Each bottle is 3.5 ounces and they’re made in the USA as well. If you’re not so sure about orange that’s not a problem because there are 7 other scents that you can choose from to get something natural and high quality you can enjoy in your own home. All you need to do is spray it where you need it. Our budget pick is a scented oil freshener that allows you to plug the base directly into your electrical outlet and then you can plug in your favorite scents. You get to choose from several different options when you head to the store because these warmers are compatible with a lot of different scents. They also help you get different scents in different rooms and because of the style, you’ll have a continuous release of scent rather than only when you decide to spray it. These plug ins are very inexpensive and you won’t need to purchase them again, which also makes them the best plugin air freshener. You just keep purchasing the refills of scents to get new options or just to keep your house smelling the same way you always did. This room spray is made to smell fresh and clean and to give you a whole lot of odor eliminating power. In fact, it has as much as 2 times the power of similar options. 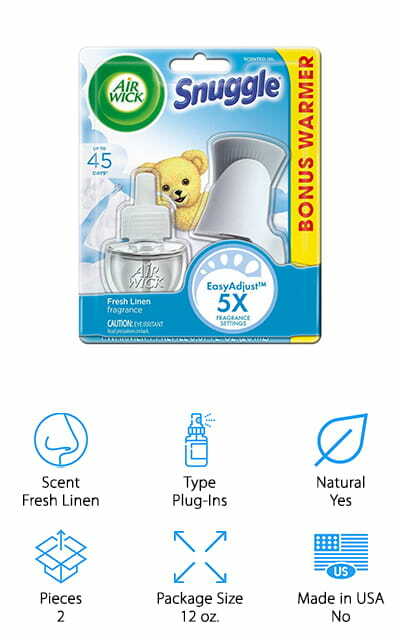 Inexpensive and sold in a pack of 3 8.8 ounce bottles, it gives a light scent. The propellant is even 100% natural, which means that it’s still safe to use around your cats and dogs. All you have to do is take it out whenever you want to use it and spray it in the areas where you need it most. 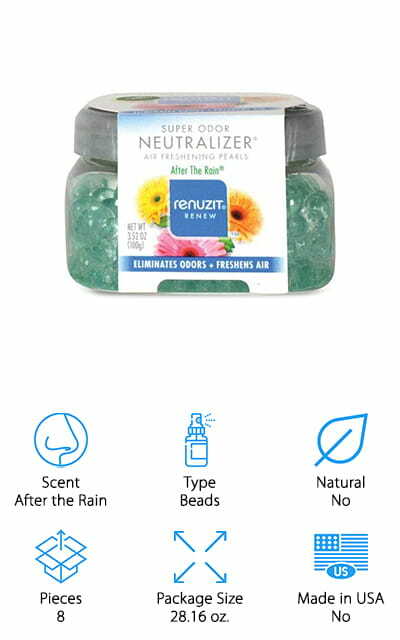 The simple use feature means that you don’t need to worry about getting it going when it’s needed (like the next time the kids come home from soccer practice) but you won’t have to worry about getting too strong of a scent either, because it’s made to be light and it can be the best air freshener for bathroom use. This gel is actually really simple to use because all you need to do is set it out in the room that you want and it will start to absorb the odors in that space. 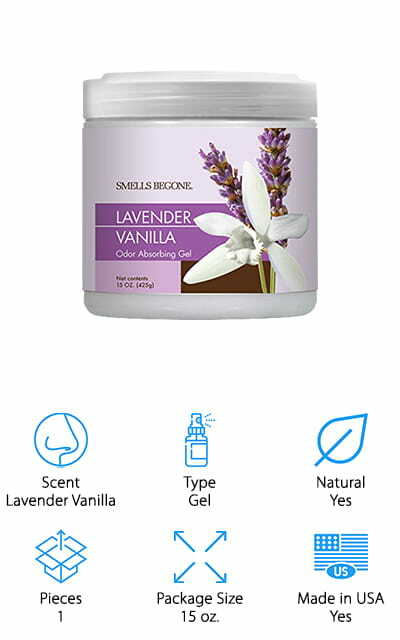 The lavender and vanilla scent of this one makes it a great choice for just about anywhere as well. In fact, it can be used in your home, in your RV or even in a car and it’s a safe scent to have around pets. Inexpensive and available in several additional scent options, This 15 ounce canister is able to get rid of odors for up to 90 days. All you need is a single unit for 450 square feet and you’ll have a light scent all over the space while you get rid of other odors. Completely naturally derived and non-toxic, the gel is also non-allergenic and uses essential oils for fragrance. You’ll get everything you need to get started when you go with this one because it comes with the gadget as well as 2 refills. You don’t need any electricity here either because you put the spray bottle into the gadget, set it where you want it and don’t worry about it again. There are several different settings for frequency of sprays and you’ll have plenty of options for refills (though this one comes with summer delights). It works for up to 60 days of continuous fragrance and can be placed in any room of your house. You’ll get a wide range for the spray that’s elevated above the unit as well, so all your scent isn’t going towards the floor like with similar options. If you’re looking for a simple spray option to make your house smell great then this 2 pack is a great way to go. It smells like vanilla and cinnamon and uses plant based natural essential oils to get you that great scent. Non-toxic and safe for the environment as well as children and pets, you could even use this as a body spray if you want (and you’ll definitely like it that much). It’s hypoallergenic and phthalate free as well as vegan. What’s even better is that it really works to absorb and eliminate odors throughout your house. Made in Texas, you can use this spray for any room in your house and even for linens and clothing or anything else you might want throughout your home. You can use it simply to relax and to get a great scent all throughout the place. 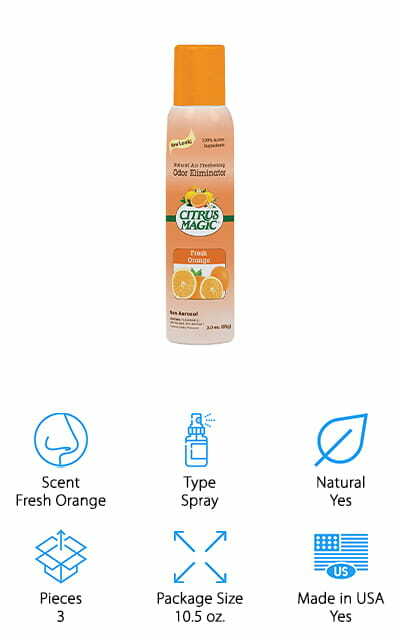 This natural air freshener is made to smell just like citrus and spice and provides you with a non-toxic scent. On top of that, it’s made without harsh chemicals or synthetic fragrances and is hypoallergenic. 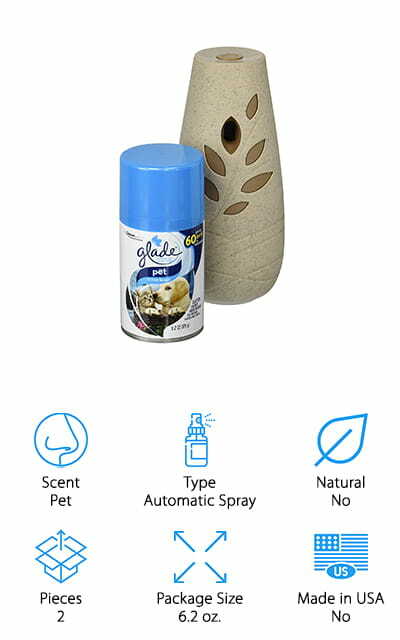 The soft scent means that you can use it just about anywhere and won’t have to worry about the artificial or overpowering scent associated with most air freshener sprays. 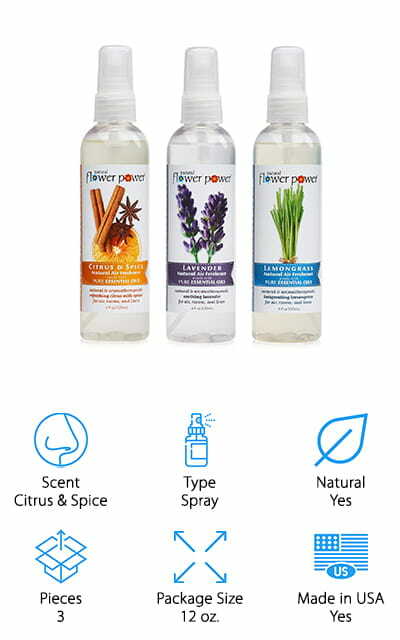 Made in the USA and never tested on animals, this spray comes in a 3 pack so you always have enough. 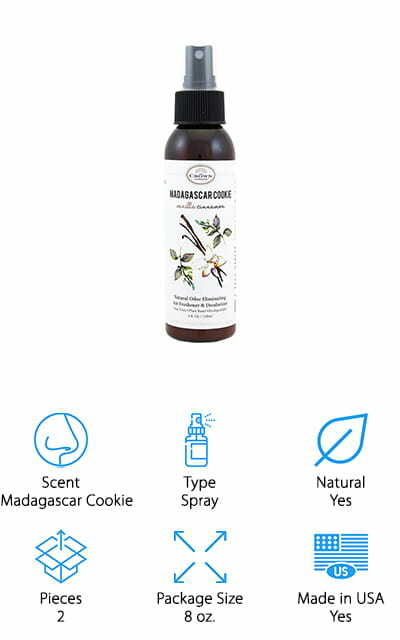 You’ll be able to use this spray on just about anything in your home including the air, your clothes and linens and even in the bathrooms to get a fresh and clean scent that you’ll definitely enjoy. You can even feel great about using it around your kids and pets. These pearls are going to be super easy to use because all you have to do is open the canister and set it wherever you want it. From there, the beads will actually do the job for you. Available in ‘After the Rain’ scent, they can last up to 30 days and are super effective at the same time. In this package, you’ll get 8 canisters that can last you up to 8 months in total time. They help to freshen up the air and make sure that you have fewer odors in your home, office or anywhere else. If you’re not sure about the scent there are also other scent choices and you get a great, soft scent that you can count on throughout your home. You just decide where you want to set it out and you’ll be ready to go. This sleek little spray bottle best home air freshener system is designed to sit out in the open but look like an accent rather than a room spray. You just put the spray of your choice inside, choosing from a range of different scent options, and you’ll be ready to go in no time at all. All you need is a battery and it takes care of spraying the area at regular intervals for you. When you’re ready to change a refill you can swap it easily and you can even get a great scent from one bottle for up to 60 days. Small and lightweight, this is a tool that you can put out in any room of your house or several rooms of your house, so you’re going to have great scents everywhere you go. That way you don’t have to worry about odor. With this best plugin air freshener for home, you just plug the unit into the wall and then attach your favorite spray scent. It takes care of the rest for you and in the case of this one, it gives you up to 45 days of scent. How long it lasts for sure depends on which of the 5 different fragrance settings you decide to go with. Rated the #1 product of the year for 2017, it’s simple to use and gives you plenty of versatility as well as plenty of different places to use it. Made with natural essential oils, you get a great scent and a great price to go along with it as well. All you have to do is find a new refill when you start to get a little tired of the old one or when the old one gets empty.